Brilliant straw color. Aromas and flavors of sliced pineapples and peach and macadamia gelatos with a supple, vibrant, effervescent, fruity sweet medium body and a sleek, interesting, medium-length finish with notes of caramel apple, pineapple upside down cake, and tropical punch powder with soft, crunchy, fruit tannins and no oak flavor. A very tasty off-dry pineapple sparkling wine that will be nice in mimosas. Bottom Line: A very tasty off-dry pineapple sparkling wine that will be nice in mimosas. 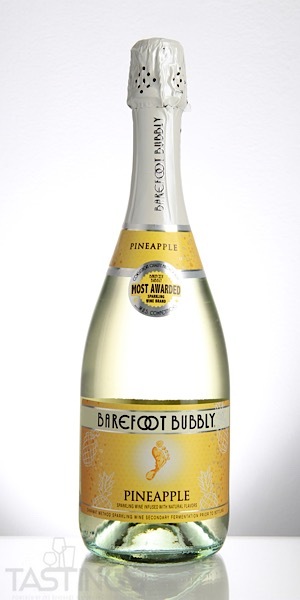 Barefoot Bubbly NV Sparkling Pineapple, California rating was calculated by tastings.com to be 87 points out of 100 on 9/24/2018. Please note that MSRP may have changed since the date of our review.